Play Sinderella online for free now! This sinful beauty has got nothing to do with fairytales - grab yourself some devilish winnings with our "Devil's Daughter"! 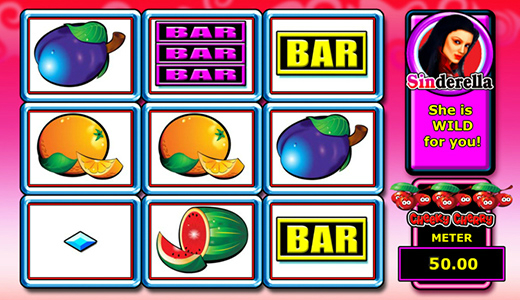 Lots of colourful fruit and bar symbols make this fiery 3-reel slot with no less than 50(!) win lines a real classic! Your aim is to land 3 matching symbols along a win line. Winning combinations can run from left to right, from top to bottom or along the corners of the playing field. To land a win, the arrangement symbols must replicate a winning combination exactly. Our little devil, Sinderella, acts as the WILD symbol and completes your winning combinations. The diabolical 7 in a 9-symbol combination will conjure up a win of epic proportions and you can land a bonus win with the Cheeky Cherry Meter along the way! The prize sum in the cherry meter increases with every spin. Land 3 or more cherries on one or more win lines to win the sum shown in the cherry meter.